Mace Warrior OC Gun is one of the most accurate non-lethal self defense sprays available. 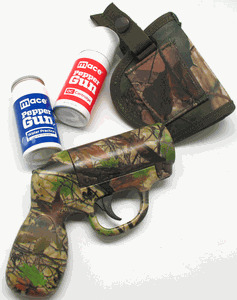 With its advanced delivery system – utilizing bag-in-a-can technology – the Mace Warrior OC Gun delivers a targeted stream of OC pepper spray up to 20 feet, and fires from any angle. The Mace Warrior OC Gun features high impact ABS construction and a popular outdoor camouflage pattern. A safe and fire mechanism prevents accidental discharge. The Warrior OC Gun comes loaded with a water practice cartridge and includes a 28 gram cartridge of OC Pepper Spray and a custom-fit matching camouflage holster.